As you prepare for the very long weekend, check out schedules of banking and mall operations this Holy Week. Whether you'll go out of town or stay at home during Holy Week, make sure you have enough cash in your pockets and food stock as most banks and malls are closed to observe the Lenten Season. Listed below are their schedules. 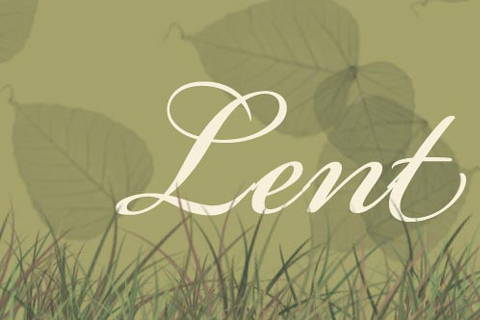 All branches are closed on Maundy Thursday and Good Friday. However, on Black Saturday and Easter Sunday, branches in NAIA, NAIA Terminal 3, and BDO Clark Forex Counter will be open until 6:00 PM while branches in City of Dreams Manila and Solaire Resort will be open until 7:00 PM. Over 100 selected branches of Metrobank will be operating on Maundy Thursday and Black Saturday. Check out the list here. All BPI and BPI Family Savings Bank branches and kiosks will be closed from April 2 to April 5. 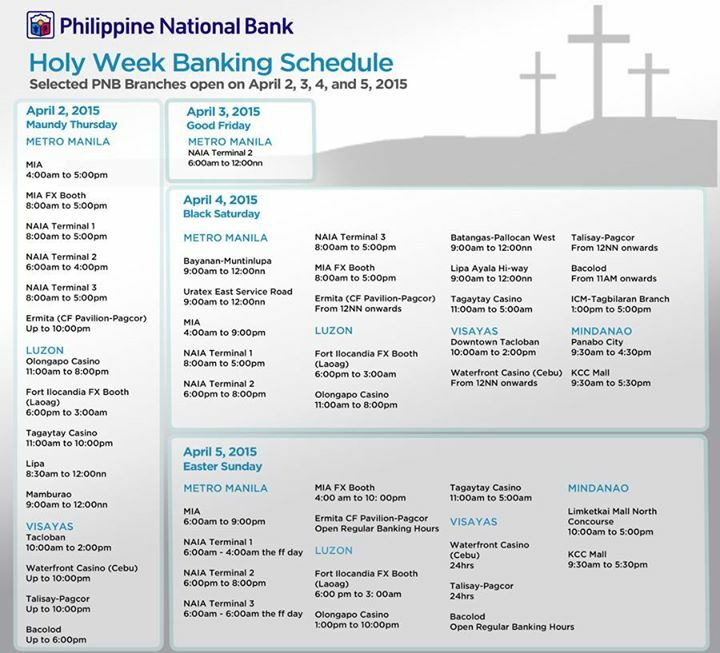 Selected PNB branches will be open during Holy Week. All Security bank branches will be closed from April 2 to April 5. However, Security Bank ATMs are available for people's banking needs. From April 2 to April 4, all UCPB branches will be closed. ATMs, mobile phone banking, connect and Telebanking remain available for balance inquiry, fund transfer and bills and payment needs. Regular banking operations will resume on April 6, 2015, Monday. All SM malls, except SM Mall of Asia veranda tenants and SM By the Bay, are closed on Maundy Thursday and Good Friday. Regular mall hours will resume on Black Saturday, April 4, 2015. All Ayala Malls (Glorietta, Greenbelt, Trinoma, Market! Market!, Alabang Town Center, Fairview Terraces, Marquee mall, and Ayala Center Cebu) are closed on Maundy Thursday and Good Friday. Regular mall hours will resume on Black Saturday, April 4, 2015 from 10a.m. to 10p.m. 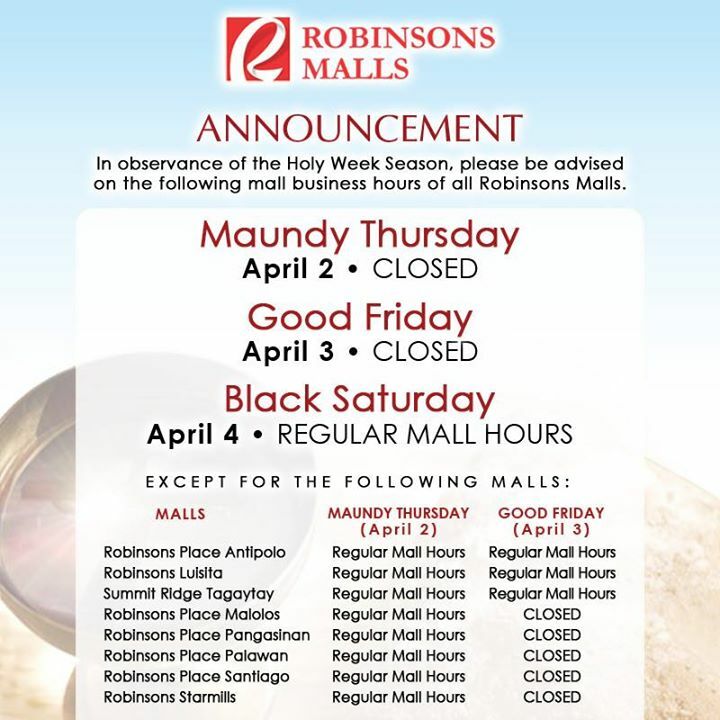 Selected Robinsons malls will be open on Maundy Thursday and Good Friday. Regular mall hours will resume on Black Saturday, April 4, 2015. Selected dining establishments are open on Maundy Thursday and Good Friday. Regular mall hours will resume on Black Saturday, April 4, 2015. Fisher mall will be open the entire Holy Week. On Thursday and Friday, it will be open from 11a.m. up to 8p.m. and on Saturday, from 10a.m. up to 10p.m. Gateway, Farmer's Plaza and Ali mall are closed on Thursday and Friday. Regular mall hours will resume on Saturday, April 4, 2015.